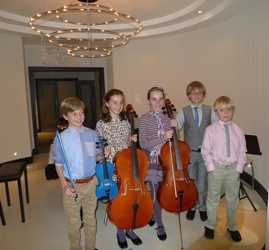 Five students performed a fun mini-concert at Grand Jersey’s Sunday Brunch in the Park Suites on Sunday 21st October. The 25 minute programme of music presented classical works by Tchaikovsky and Grieg alongside jazz pieces by Gershwin. This is the launch of a new partnership between the academy and Grand Jersey to give talented young instrumentalists some positive performing experience in a warm and encouraging environment. More dates are planned for 2013.